SCOTTISH holidaymakers have been warned they face the threat of arrest – and a ruined summer holiday – if they attempt to board an international flight or ferries with unpaid fines. Court officials have put out the warning in a bid to encourage anyone with outstanding fines to pay up before they try and jet off for a sunshine break. The warning came after a man was stopped at Edinburgh Airport as he was about to leave the country. Instead of the usual security questions he was instead confronted about unpaid fines and after it emerged a warrant was outstanding for payment he was given an on-the-spot fine of hundreds of pounds before he was able to catch his flight. Legally, defaulters with unpaid debts attempting to leave the country can be forced to pay on-the-spot fines. And if someone has not paid their fines and a warrant has been issued for their arrest then they could ultimately wind up in custody if they cannot make a payment – swapping a relaxing week in the sun for an uncomfortable stretch in a jail cell. In one recent case, a man from Rosyth was stopped at Edinburgh Airport. He had been required by Dunfermline Sheriff Court to pay a £745 fine in instalments, but after failing to do so a warrant was issued for his arrest. He was stopped by the police before boarding his flight and only allowed to continue his journey after settling the outstanding amount immediately. 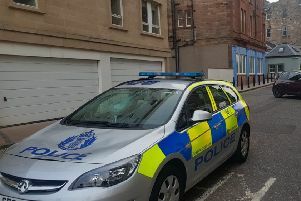 Scottish Courts and Tribunals Service (SCTS) acting chief operations officer David Fraser said officers wouldn’t be fazed at the thought of potentially stopping someone enjoying a sunshine getaway. The SCTS stressed that “almost all fines can be paid quickly and easily around the clock on the SCTS website”. And unpaid fines could also catch up with anyone planning to head off on a ferry trip or cruise, with the SCTS able to stop passengers at ferry terminals – as well as to clamp an individual’s car or approach their bank, employer or the Department of Work and Pensions to deduct money directly from their accounts, wages or benefits. A spokesperson from Edinburgh Airport said that “there were few cases” of on-the-spot fines being issued, and despite the initiative being enacted back in March 2008, major travel agencies do not consider it necessary to warn or encourage their customers to pay unpaid debts before going abroad.